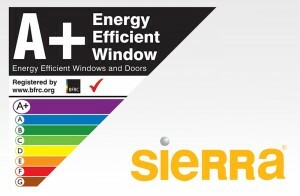 Sierra Windows is pleased to announce that it now offers A+ energy rated windows as part of its product package. In offering the very best that the industry has to offer Sierra Windows can support its customers in responding to the change in consumer demands, for high performance, energy efficient products. The company’s A+ rated products are available from the Swish Twentyfour Seven range and can be achieved with both double and triple glazed units. The Twentyfour Seven 44mm triple glazed unit achieves A+26. Speaking about the importance of offering the very latest in product technology, Adrian Harlock, general manager at Sierra Windows said: “We’re very excited to have joined what’s a rather exclusive club. There aren’t many of our competitors who are currently set-up to offer A+ rated products and that puts us in a very strong position. A dedicated member of the team is also on-hand to take customers through the process of registering with BFRC, so for more information on A+ rated products and to find out how they can support you in staying one step ahead of the competition, call Sierra Windows on 0808 178 3455. For up to the minute information, news and highlights follow @sierrawindows.